BOSTON, Mass. - 90+ Cellars, New England's premier wine brand, is kicking off ski season with the ultimate après ski essential. 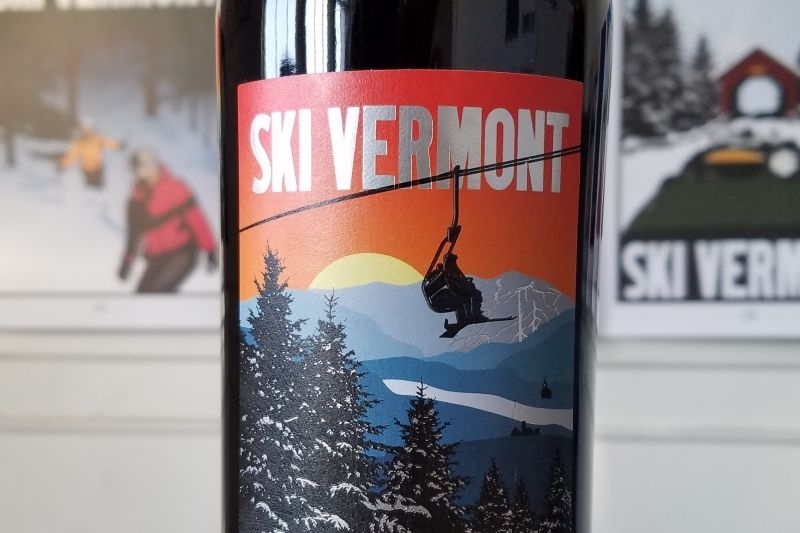 90+ Cellars SKI VERMONT Cabernet Sauvignon is a limited-release wine created in partnership with Ski Vermont, a nonprofit organization and the proud ambassador of the #1 state in the East for skiing and snowboarding. $1 from the sale of every bottle will be donated to Ski Vermont and used to fund a new scholarship program for Vermont students. "Ski Vermont and its 20 alpine and 30 cross country area members have long been committed to delivering the top ski experience in the East," said Molly Mahar, president of Ski Vermont. "We are thrilled to collaborate with 90+ Cellars, a New England-based company that shares our appreciation for all that makes this corner of the country so special. This partnership allows us to directly invest in the employees and leaders of the future, so they can continue to deliver the topnotch experience that visitors to Vermont's world-class resorts have come to expect." This 2016 Cabernet Sauvignon from California is full-bodied and textured with hints of vanilla, dark chocolate, blackberry and warm oak spices, making it the perfect wine to enjoy while warming up in the lodge after a long day on the mountain. The vibrant label, featuring artwork from one of Ski Vermont's official posters, captures the spirit of the slopes and splendor of Vermont's mountain landscape. The Boston Herald recommended Ski Vermont Wine in its 2018 Ski Wednesday Gift Guide for the wine lover on your holiday shopping list. Follow @ninetypluscellars on Facebook and @90pluscellars on Twitter and Instagram. For the latest conditions and updates, resort-finder, events and more, visit skivermont.com and keep up with @ski_vt on Instagram, @Ski Vermont on Facebook and @ski_vermont on Twitter. Latitude Beverage Company is the innovative, Boston-based company behind a portfolio of national wine brands, including 90+ Cellars, Lila Wines, Mija Sangria, Iron Side Cellars, Places Wines and Magic Door. The company was founded in 2007 by Kevin Mehra who saw an opportunity to make high-end wine more accessible by purchasing oversupply from top wineries across the globe, bottling the wine under his own labels, and selling it to consumers often at a fraction of the original source price. This unique business model, based on the centuries old function of the négociant, became the foundation for 90+ Cellars. This same model has enabled Latitude Beverage Company to expand its portfolio with additional labels, and the company is now recognized as one of the fastest growing wine companies in America. For more information, visit ninetypluscellars.com. Download images of 90+ Cellars here. Ski Vermont is a proud ambassador of the thriving winter tourism industry in Vermont, where the legislature has designated skiing and snowboarding as the official state sports. Vermont is the #1 ski state in the east and reigns supreme in snowmaking quality and coverage, variety of terrain and historical impact on the sports of skiing and snowboarding - making it one of the most significant ski and ride destinations in the world. Ski Vermont's mission is to help create a legislative, economic and social environment in which the state's ski areas can grow and prosper. For the latest updates, conditions and events, visit skivermont.com and follow Ski Vermont on Facebook (www.facebook.com/skivermont), Twitter (@Ski_Vermont) and Instagram (@ski_vt).